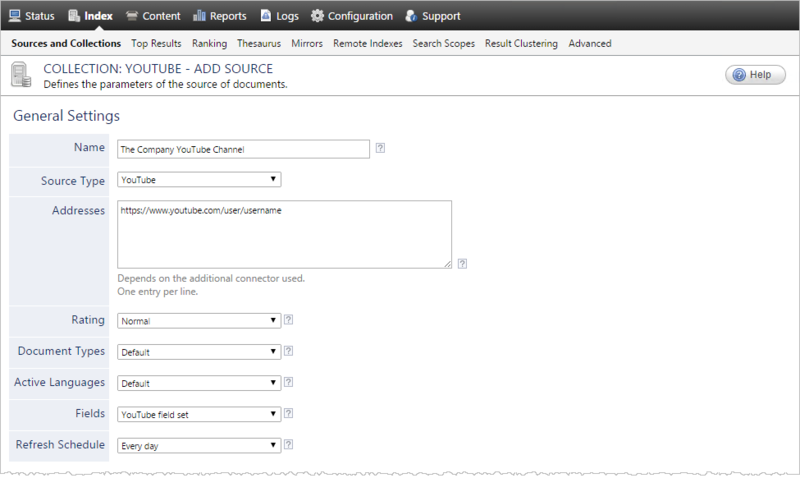 A source defines a set of configuration parameters for a specific YouTube channel. Select the connector used by this source. In this case, select YouTube. Note: If you do not see YouTube, your environment does not meet the requirements (see YouTube Connector Requirements). Enter the URL of one or more YouTube user or brand channels, or playlists. When you enter a URL pointing to a specific user who manages more than one channels, the connector indexes all videos under these channels. CES 7.0.8541+ (September 2016) The connector supports playlist URLs. Select the field set that you created for your YouTube source (see YouTube Connector Deployment Overview). Time interval at which the index is automatically refreshed to keep the index content up-to-date. By default, the Every day option instructs CES to refresh the source everyday at 12 AM. Because the incremental refresh takes care of maintaining the source up-to-date, you can select a longer interval such as Every Sunday (see What Should Be the Frequency of Source Refresh Schedules?). In the API Key box, enter the API key you previously created (see Allowing the Coveo Connector Access to YouTube Data). In the Mapping File box, the path to the default mapping file that defines how the connector handles metadata often does not need to be changed. CES 7.0.8388+ (June 2016) Select the Index Playlists check box when you want YouTube channel playlists and playlist items to be indexed. CES 7.0.8541+ (September 2016) This option is not used when you specify a playlist URL in the User, Channel, or Playlist URL parameter. CES 7.0.8225– (March 2016) YouTube channel playlists and playlist items are indexed by default. Click Add Parameter when you want to show and change the value of advanced source parameters (see Modifying Hidden YouTube Source Parameters). Ensure that this option is selected since YouTube video IDs are case sensitive. In the navigation menu on the left, select Permissions. 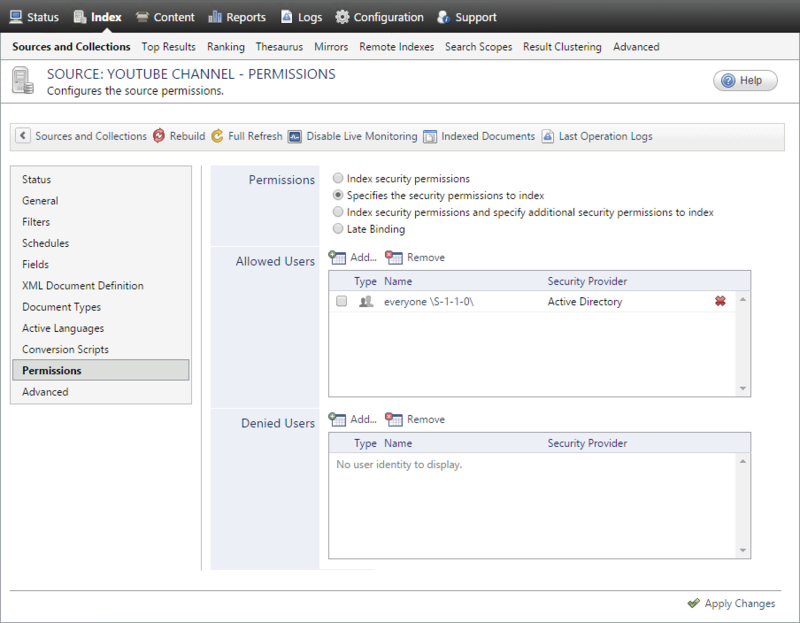 Next to Permissions, select the Specifies the security permissions to index option. Next to Allowed Users, ensure that a well-known everyone group such as the Active Directory everyone \S-1-1-0\ is added. On the toolbar, click Rebuild to start indexing your source. Consider modifying some hidden source parameters to try resolving other issues (see Modifying Hidden YouTube Source Parameters).